Dennis Keith Rodman is an American retired professional basketball player, who played for the Detroit Pistons, San Antonio Spurs, Chicago Bulls, Los Angeles Lakers, and Dallas Mavericks in the National Basketball Association(NBA). He was nicknamed “The Worm” and was known for his fierce defensive and rebounding abilities. 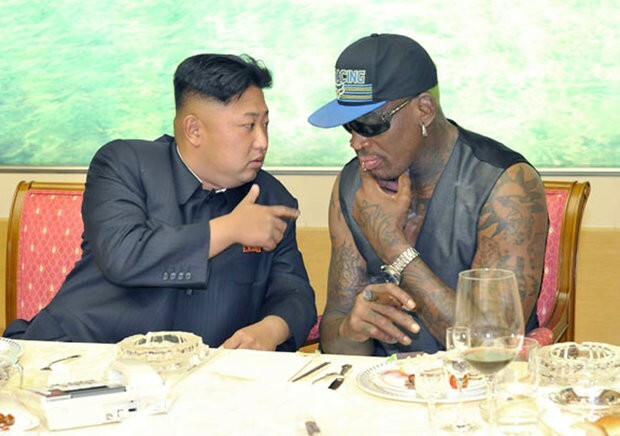 What people may not know about Dennis Rodman is that he is friends with Kim Jong Un, North Korea’s dictator. A former NBA player is offering to mitigate international tensions between a ruthless dictator and President Donald Trump. Dennis Rodman, who has visited North Korean leader Kim Jong-un several times, is offering to help the U.S. “straighten things out” with North Korea after the two countries have escalated tensions with threats of nuclear war. “I just want to try to straighten things out for everyone to get along together,” the former NBA star told “Good Morning Britain” on Wednesday. “Kim is just like everybody else,” Rodman said of his friendship with the North Korean dictator. He told host Piers Morgan that his trips to Pyongyang included “cool things” like karaoke, skiing, horseback riding and laughing. Watch the clip from “Good Morning Britain” below.